There are few other garments worn in life that hold the significance and memories of a wedding gown. At Sudbury Steam Cleaners we understand this and pride ourselves in treating these garments with the absolute care they deserve. Our process starts with a detailed examination of the gown so our experts can determine what cleaning treatment to use to best clean and preserve your dress. After the cleaning process, we will re-inspect the garment to determine if any more treatment is necessary. 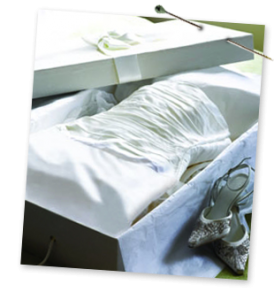 Once the dress passes our strict examination, it will be hand pressed for delivery back to you either as is, or carefully boxed in acid-free tissue paper to optimize preservation. For linen rentals, click here.